This beacon was installed to help people on the I-205 cross SE Division Street. 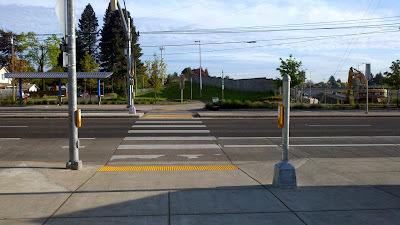 The original design was recently enhanced to provide an additional push button on the "right hand side" of the street. The added pole to the intersection and resulting costs were something that could be debated as whether it was necessary, but the additional pole eliminates the need for people to cross the oncoming multimodal traffic. The added pole frames the crossing and for an oncoming bicycle eliminates the need to cross to reach the push button on the left hand side of the "street". It's not a major issue, but it is somethign that has come up on several occasions. As we have been building infrastructure that is designed for more than just for people walking, these sorts of design details seem worth sharing, so cycling is more intuitive and that users expect a push button or a signal indication on the right hand side of the street. Good addition where bikes are using the crosswalk. There are many locations throughout the city where pedestrian pushbuttons are hidden from a walker approaching a crosswalk. A pushbutton that faces the street is nearly always in the wrong place to be seen and/or used by walkers, whether on a pole at the back of the sidewalk, or on a pole near the curb. They should be at 90 degrees to the street (as these are), or face the sidewalk from the curb location. I'm sure signals now has new practices, but there are a lot out there that need to be moved to be easily visible.